I don't know about you, but nothing is more annoying than when my phone hits 15% and I'm nowhere near a charger. Not just because I know my phone will die soon, but until I reach a charger, I have to deal with the annoying low battery notification and LED light. Well, with Android 9.0 Pie, we finally can escape this. With Android 9.0 Pie, Google is expanding Notification Channels, first introduced in Android 8.0 Oreo. 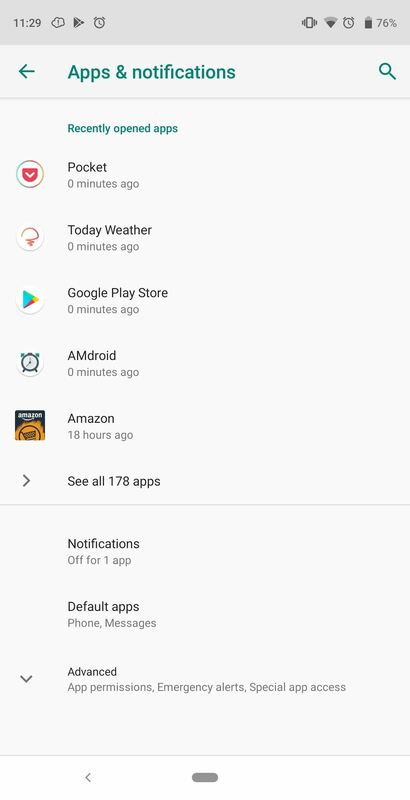 Not only are they pushing all new apps and updates to target Oreo, forcing more apps to adopt the feature, but they are expanding Notification Channels to work with preinstalled apps like System UI, which manages the low battery notification, among other things. In short, you can finally change how the low battery notification appears, or even turn it off altogether. 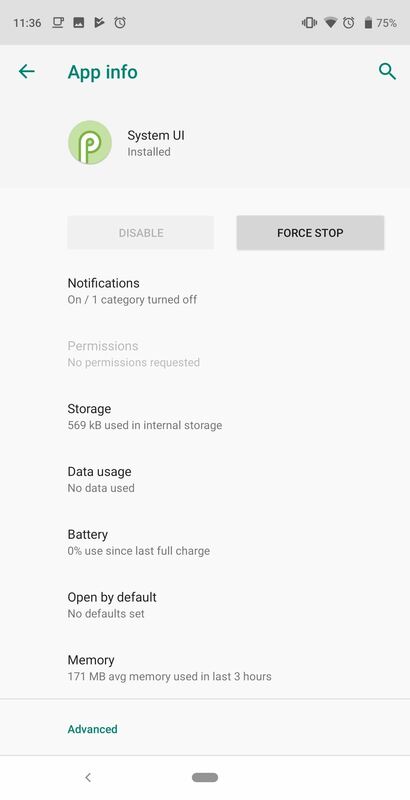 You have two options for dealing with those annoying "Battery is low" notifications in Android 9.0 Pie: You can either make them less intrusive, or outright disable them. I'll cover both method, starting with instructions for turning it off. Open the main Settings menu and select "Apps & notifications." Choose "see all X apps" (X will be the number of apps installed on your phone) and select the three vertical dots in the upper-right corner. 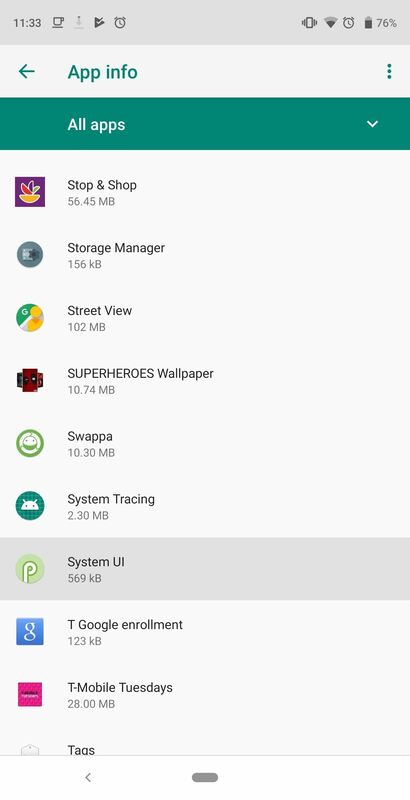 Choose "Show system" to reveal the system apps in the list. Once selected, find "System UI" on the list and select it to open its App Info page. Choose "Notifications" to reveal a list of all the different categories of notifications created by the System UI app. Find the checkbox next to "Battery" and simply tap it to disable notifications. Select the back arrow in the upper-left corner to save your choice. When done correctly, you will see a message at the bottom of this menu stating "1 category deleted," indicating you turned off battery alerts. With battery notifications disabled, you no longer have to dread the irritating alert when you hit 15%. However, understand that turning off this alert can be bittersweet. While you won't be bothered by the warning, besides actively checking your battery percentage, you will not know when your phone's battery is near depletion. However, Android Pie gives you more than just the ability to turn it off. You can also modify the alert to your liking. On the App Info page for System UI, select the text "Battery" instead of the checkbox. 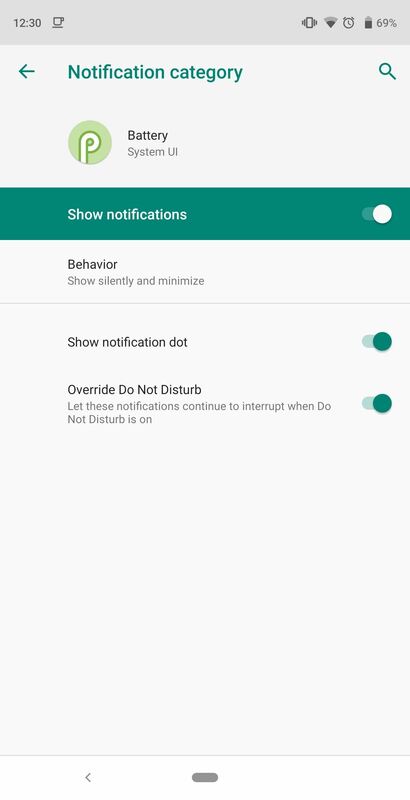 Choose "Behavior" to reveal several options to how you can adjust the notifications. 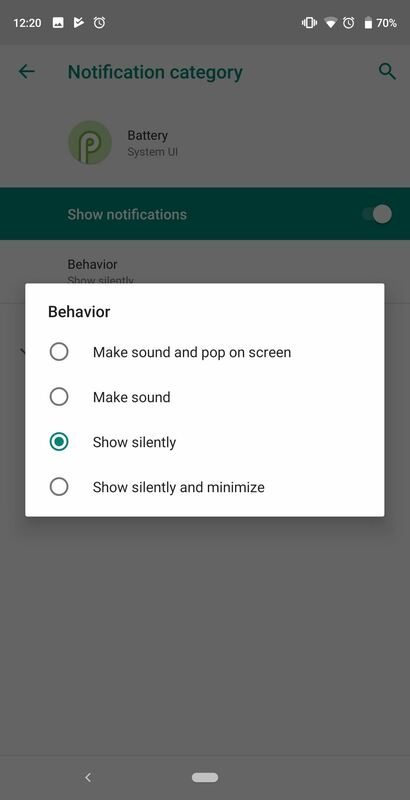 To turn off just the sound but still have the alert pop on your screen, choose "Show silently." If you, however, don't want either audio or for the alert to pop on your screen, choose "Show silently and minimize." 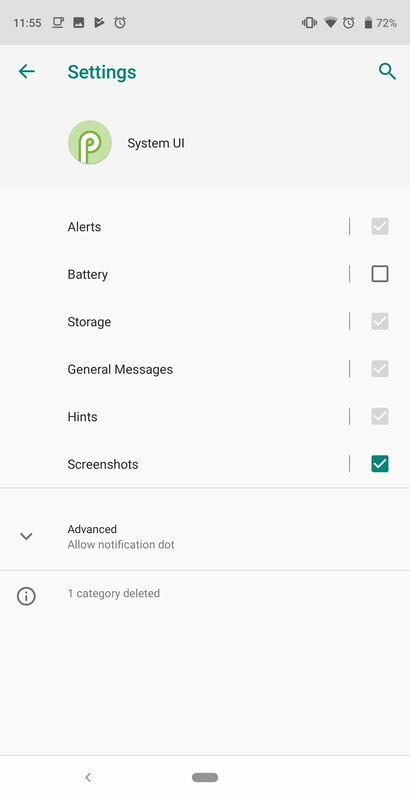 With this option, the alert will appear on your notification shade with any warning. Finally, after selecting the option, you can choose to disable "Override Do Not Disturb" to prevent this notification from disturbing you while Do Not Disturb mode is enabled. Whether you decide to turn off or adjust the low battery warning is up to you. At least now, we have the option. However, if you follow our recommendations in our bad battery habits article, you wouldn't even be pushing your phone to such a low battery percentage in the first place! I'm looking exactly for a way to disable the low battery light. However, I don't have the System Ui app visible on your screens. My phone is on Android one program and has Android 9 pie. Any alternative to accomplish this?